A page dedicated to Band activities for 2008 - other than the main events linked above. We have had a lot of problems with this event this year. We almost cancelled. The Kuwait authorities have been cracking down on expat events - with mixed dancing and music. Anyway - with our Kuwaiti patron's help, we managed to get the necessary license and went ahead with the event. Under the guise of "traditional dancing" versus the bump-and-grind disco type dancing that seems to be the most offensive to our hosts. Bader's son had a very bad motor-cycle accident a couple of weeks ago, and he's missed all the practices since he was at the hospital all the time. Ramsay still isn't out of the woods, risking permanent brain damage. Anyway - Bader missed this first Caledonians event in 18 years (so he says). It was up to John to lead our little band tonight. Anyway - here is the link to the special web page I've built and we're hosting on our personal web site for the event. Lots of pix. Yet another Saturday practice session at TES. This time I caught Eugene blowing up his "goose". Another of our twice a week practice sessions with the St Andrew's Ball coming up fast on the 28th. Jane still struggles with her "goose". Bader, Lyndon and Stuart give her some tips. Bader decided on a slightly different session for tonight rather than drone on on our regular tunes on the practice chanters. 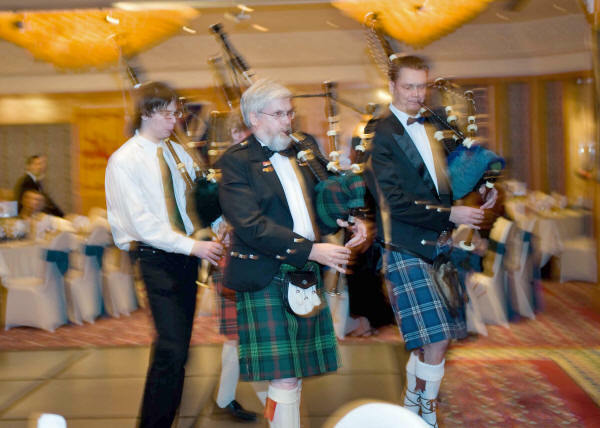 He wanted to show Andrew, Stewart and Philip how to maintain their bag pipes so he doesn't have to use so much of our practice sessions getting peoples pipes going. Mine were new in 2004 - and don't need any attention, while Philip's are my old 1970 vintage Hardy pipes - and need more hemp replacement. Our newbie's get in some tunes before we "experienced" players showed up. Jane and Eugene. Bader instructs on the way to wind hemp on our pipes. You start with 2-1/2 meters of hemp doubled up for winding on the drones. Philip practices winding his drones. Its been many months - so its time the band got together to practice again - this time for St Andrew's planned for November 28th. Andrew has his new pipes now, and has made very good progress getting up to speed with the rest of us. Bader tries out his new pipes again. The English School (TES) once again has offered their auditorium for us for a couple of hours on Saturday afternoons. Poor Jane is having a lot of problems getting the breath up for even an easy chanter reed. We posted this today on our Q8Caledonians web site. 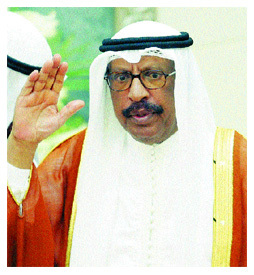 due to the death of His Highness the Father Amir of Kuwait Sheikh Saad Al-Abdullah Al-Salem Al-Sabah Tuesday. Sam has talked to the hotel, and they recommend cancellation in respect to the Kuwait people. Refunds will be arranged as soon as possible. On the positive side though - we all got a 4 day weekend out of the tragic event. This sort of thing happens here when royals die. - and John Carmichael arrived the day the Sheik died - so we have about $1500 sunk costs to eat. The handbill built for the Ceilidh. The band is being silly again. On this Saturday pipe practice session at The English School (TES), we had delivery from Bader of our custom-tailored tartan dish-dashas. For our Thursday performance at the Spring Ceilidh at the Hilton. They fit pretty well - on us, at least. Bader though Stuart's dish-dash wasn't the right fit. Turns out its a sleeping dish-dasha they patterned off for Stuart. A lot more "spacious" for sleeping in than a standard dish-dash for everyday use. Our next gig after Burns'. The Kuwait Caledonians Pipe Band was invited to play again at the British Embassy for the Queen's Birthday celebration. Philip was excused because he doesn't have a kilt yet. The only pic of John tonight - since Alice decided to stay home. Again Lyndon and John stayed in the gardens and played for the guests arriving. Later we played as we marched the Ambassador and Guest of Honour (Kuwait Minister of Information) to the podium. Then our band played to give the prima-dona Military Brass Band a few minutes break, then Lyndon and John played while they lowered the flag at the end of the evening. A lot of playing for free. At least they had some free beer. Andrew, Bader and Lyndon - waiting for Stuart to arrive. These guys played out front while the guests arrived - while Lyndon and John played inside. Flown in for this performance - they had to play about 1/2 an hour while sitting, then take a 15 minute break while we covered (not sitting down), and then another 40 minutes. And they got paid for this!! The birthday cake with the ceremonial sword cut. Well covered by the press. About 500 guests in the Embassy gardens. We've started up the weekly pipe practice sessions again - now we have a gig next Wednesday. Here are some pics of the proceedings. Jane's first time picking up the pipes. The big event finally arrives. As always - we've built a special web page featuring ours and David Niven's photos from tonight. The band needed a play to blow up our pipes. Lyndon was able to negociate with TES to use their auditorium before our performance at Burn's in a few weeks. It was the best venue yet for our practices - we hope we'll be able to use it again in the future. Andrew Bates - has made excellent progress catching up to the rest of us. Talal now back for a while from Jordan. He too has made very good progress.